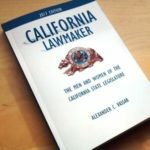 Now available on Amazon.com is California Lawmaker by Alex Vassar, editor of the One Voter Project. Alex has spent years studying the California’s Legislature and is quoted regularly by journalists around the state. California’s Legislature and the people who have served in it have an amazingly rich history. Some have held positions of national importance like Secretary of Defense Caspar Weinberger or US Supreme Court Justices Joseph McKenna and Stephen J. Field (all of whom served in the Assembly). Henry G. Worthington, an Assemblyman elected in 1862, would later serve as a pallbearer at the funeral of Abraham Lincoln. Not all these stories end well. California legislators have also been fatally wounded in a bar brawl or died in a drunken canoeing accident. 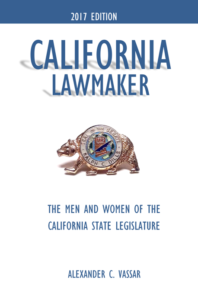 Current through the start of the 92nd Session (2017-18), this is the story of the 4,424 men and women who have served in the California Legislature. In addition to the current session, this book explores the history of the legislature since 1849. Arriving at the State Capitol as a Senate Fellow in 2007, Alex Vassar has more than a decade of experience in California public policy. Alex has worked in both houses of the California Legislature, as a Senior Policy Advisor for a member of the San Jose City Council and an appointee at the State Board of Equalization. His love of California political history led him to create the One Voter Project [onevoter.org], an effort to examine trends and explore the remarkable history behind the golden state that we know today. Through his research, Alex has become a trusted reference on legislative history and you can find his quotes in the pages of the Los Angeles Times and Sacramento Bee. Alex can occasionally be found at the Capitol during his lunch breaks, catching up on the latest news or leading tours for school groups. Q: How often do Lt. Governors become Governor through the resignation or death of the incumbent? A: It has happened three times in the last century, following the resignations of Earl Warren (1953) and Hiram Johnson (1917) and the death of James Rolph (1934).